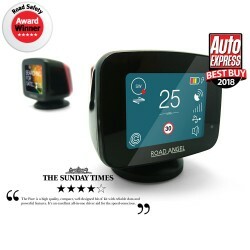 Road Angel is a leading manufacturer of road safety equipment, creating advanced speed camera detectors that will keep you safe on the road at all times. These handy devices help you to be aware of the speed limit wherever you are and can detect the radar or laser of a speed camera to alert you and make sure you know to slow down in these dangerous areas. Supported by the UK’s most accurate speed limit database, you’ll never need to guess how fast to go when you use a Road Angel speed camera detector. 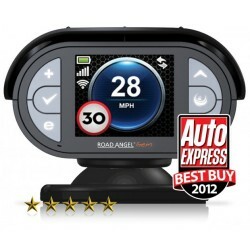 The Road Angel Gem speed camera detector features an in-built screen that can give you information as you drive. The speed limit of the road your on will be displayed in the bottom left corner, with your current speed prominent in the centre of the screen. Also included is the revolutionary feature, eAssist, that connects you to an emergency response call centre should you find yourself in an emergency situation. The Road Angel Gem Plus is a deluxe speed camera detector with even more features than the Gem. In addition to the features above, the Gem Plus can provide live traffic updates to help you stay on the best route. Remember, if you come into one of our stores we’ll fit your Road Angel speed camera detector on the spot. so I could play songs from my iPhone in my car. the cheapest around and worked perfect.